Your choose your length, color and cable ends from the options above near the purchase buttons. 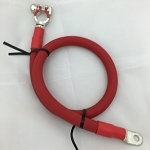 The copper ring terminal lug cable end choices are 5/16 or 3/8 which are professionally crimped onto the red or black copper battery using the UL approved crimping tool as specified by the manufacturer. We then seal the connection point with adhesive heat shrink tubing in the color to match the cable. 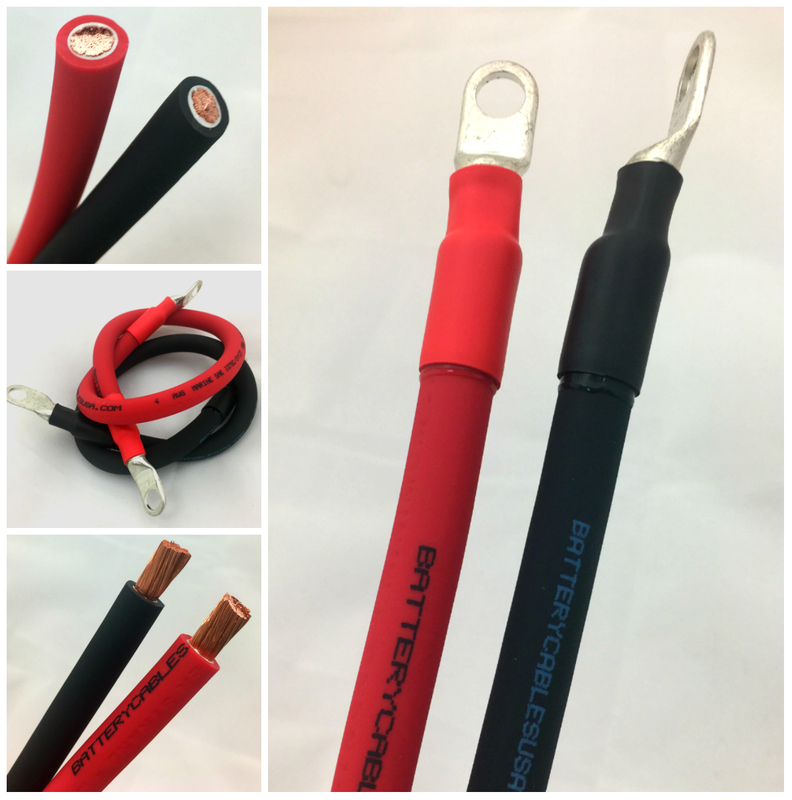 The heat shrink has a melt-able glue lining to help seal your cable from air and moisture. The copper lugs feature a tin plating which is resistant to corrosion you'll see on bare copper ring terminals. If you need something special with regard to the length or lugs outside the available options please send us a message and we may be able to help you out. 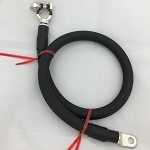 This 6 AWG Gauge extreme battery cable is specially designed to meet the demands of various environments while staying extremely flexible. Full AWG sized copper conductor made from 99.9% pure annealed electrolytic copper, will you get maximum power. The insulation and jacket compounds are specially formulated to stay flexible even in cold weather and carry a -49C to 105C temperature rating. The jacket is resistant to chemicals, water, abrasions, oil, sunlight and has a color coded dual extrusion jacket with a white inner insulation which would show any damage to the outer cable more clearly. This cable is rated up to 600 Volts and is suitable for use in automotive applications, solar battery bank wiring, power inverter battery cables, marine battery cables and many other applications calling for a durable yet flexible battery cable. The battery cables meet the requirements of SAE J1127 and J378 making them ABYC and US Coast Guard approved for boat and marine use. Final pointers on lug sizing....most threaded stud batteries will have either a 5/16 or 3/8 inch stud. Most of the time the negative will be 5/16 so if the positive is the same size it is also 5/16, but if your battery stud is larger on the positive it will most likely be a 3/8. There are exceptions to the rule so please contact the manufacturer or measure. You can search online for bolt sizing tables which will help. If you have questions about cable sizing and whether this is the correct size feel free to send us a message and we will do our best to answer you or at a minimum steer you in the right direction. Got a great set of battery cables with ends at a great price. The staff was helpful and friendly; I highly recommend this company!